The Australian Hi-Fi & AV Show 2017 will be held at the InterContinental in Sydney July 28th - July 30th and is your chance to hear the world’s finest audio products in one place. The worlds best systems deserve the best demonstration environment and the luxurious rooms at the InterContinental are the perfect choice. Bring your music, relax and listen to it on some of the world’s best systems. Before you buy, get hands-on experience and compare all types of audio gear from speakers, electronics and turntables to headphones, music streamers and computer systems. Meet the experts - designers, editors and writers, in seminars designed to help you learn: how-to set up your system; stream music around your home; turn your computer into a high-end audio source; how to control everything from your Smartphone and tablet - and more! Story courtesy of Jez Ford editor of Sound+Image magazine. We blasted some vintage and late Bowie through this system and thoroughly enjoyed the way it brought 'Hunky Dory' into a new level of clarity, while managing to deliver both the immersive swirl of Blackstar and its slightly bonkers drum'n'bass beatiness simultaneously. 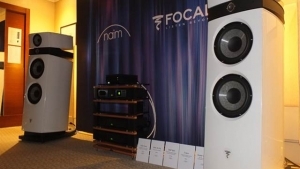 The speakers are the latest 'Evo' iteration of Focal's Utopia III Maestro, while the teaming with Naim electronics is, of course, de rigeur given the co-ownership of the two companies. Their design teams are in regular contact, we gather, so complementarities should continue to blossom. Story courtesy of Jez Ford editor Sound+Image magazine. We have a review ready to publish in Sound+Image on 1MORE's over-ear triple driver headphones, and here's a quick spoiler -- we really like them. 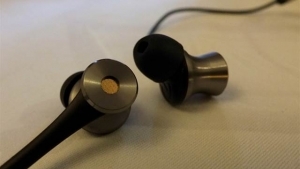 They are at the Show available to audition, alongside a brand-new launch for the 1MORE dual-driver LTNG in-ears with active noise-cancellation (pictured above), priced at $189. The LTNG name indicates that they have a Lightning cable rather than minijack, so they take the signal digitally from iPhone or iPad, applying their own DAC and audio stage for the dual in-ear drivers. Story courtesy of Jez Ford. While there are systems at the Show that push over half a million dollars, and esoteric brands a-plenty, QualiFi's room, with its stunning views to Sydney Harbour Bridge and the Opera House, delivered sweet sound from a relatively simple combination of Marantz electronics and Jamo loudspeakers. 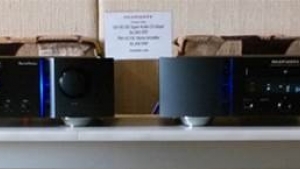 With the SA14S1SE CD player at $4990, and the PM14S1SE amplifier at $5490 as electronics, and the Jamo Concert C109 (below) on loudspeaker duties, listeners were proclaiming the well-matched combination as delightful a listen as many of the higher-priced systems at the show. Copyright © 2019 Chester Group Exhibitions (Aust) Pty Ltd. All rights reserved.